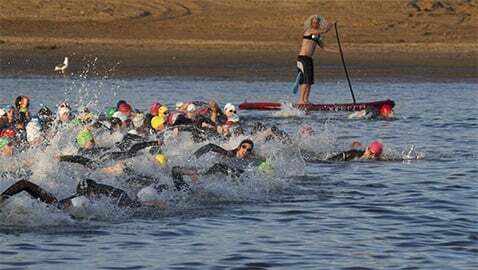 Nearly 300 competitors gathered on Fiesta Island in Mission Bay last weekend to take part in the eighth annual Tritonman Triathlon. Put on by the 15-man UCSD triathlon team, the event stretched across two days. Starting at 7 a.m. on Saturday, Feb. 22, University of Arizona’s Ben Kanute won the draft-legal competition. The following day, 283 racers took part in the traditional rules triathlon, won by UCSD SIO graduate student William Jones. “I think we did really well, and we had a couple great showings,” UCSD triathlon captain Bryce Zaffarano said. Teams from across California came to participate in the event, including UCLA, Cal, Stanford, Cal Poly and UC Santa Barbara. According to Zaffarano the event drew nearly 100 more competitors than it did last year and welcomed a number of professional athletes as well as one paratriathlete, Mary Kate Callahan from the University of Arizona. Zaffarano said next year the event will be certified for more paratriathletes to take part in. This weekend, the UCSD triathlon team will compete at UCLA. Zaffarano said he hopes UCSD — which placed in the top-10 in the national meet last year — will place in the top-five in this year’s meet on April 3.